I am so excited that the holidays are right around the corner. I actually feel somewhat prepared this year with my Stocking Stuffers for Preschoolers figured out already and tickets booked to a Christmas Spectacular at Radio City in NYC. I’ve always wanted to take Riley to see the Rockettes, but I thought she was the perfect age this year. In order to help me celebrate the victory of actually scheduling this holiday event, I thought it would only be fair to share with all of you our Peppermint Red Velvet Cake Pops. Now all I need to do is nail down a date for our Cookie Recipe Exchange Extravaganza. 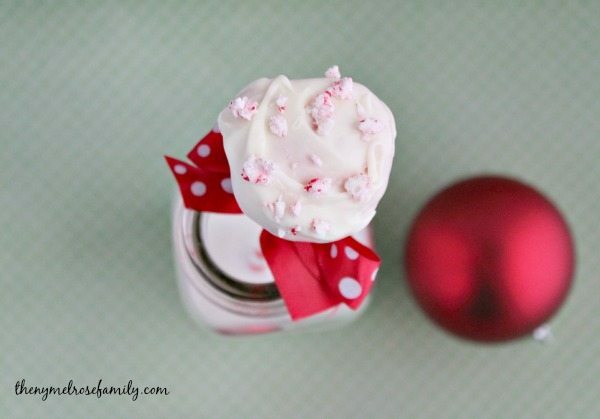 One of my absolute favorite flavors is definitely peppermint for this time of year. 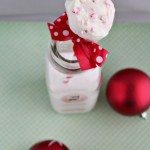 My Mason Jar Peppermint Cupcakes make the perfect holiday gift that absolutely anyone would love to receive. I also created Peppermint Mini Bundt Cakes and Chocolate Peppermint Cupcakes that will work great for upcoming holiday parties. These cake pops are dressed up with red and white striped paper straws and a polka dot ribbon bow as the finishing touch over the cake pop popsicle stick. I used Betty Crocker Super Moist Red Velvet Cake Mix with 2 tablespoons of Betty Crocker Rich & Creamy Vanilla Frosting. For our full tutorial on how to create the perfect cake pop check here. My favorite part and definitely my four year old’s favorite part was smashing the peppermint candies. She had a blast smashing the candies with a meat cleaver and I made sure that she didn’t smash one of our kitchen tiles in the process as you can see here. Be sure to follow along for all the behind the scenes fun! I hope that you all have a Merry Christmas and enjoy the time with your family and friends. 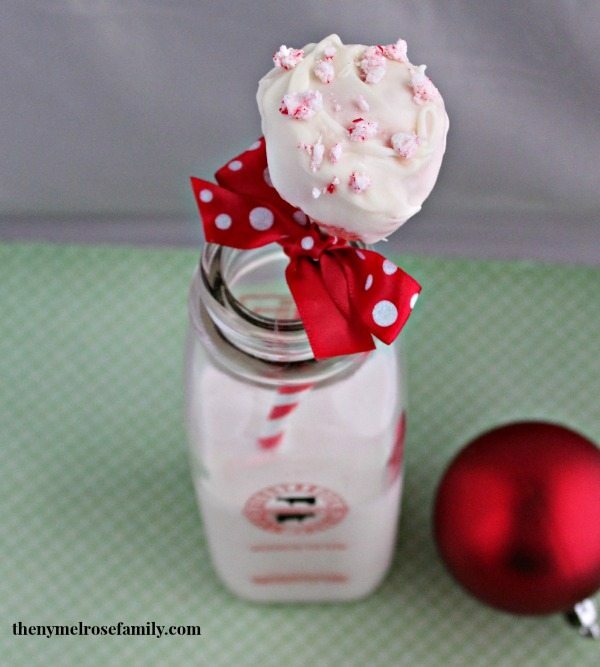 A red velvet cake pop with hints of peppermint. Bake the Red Velvet Cake Mix according to the instruction and let cool. Once the cake has cooled crumble it into a large mixing bowl and add in the vanilla frosting. Mix together and create cake balls the size of a golf ball or smaller. 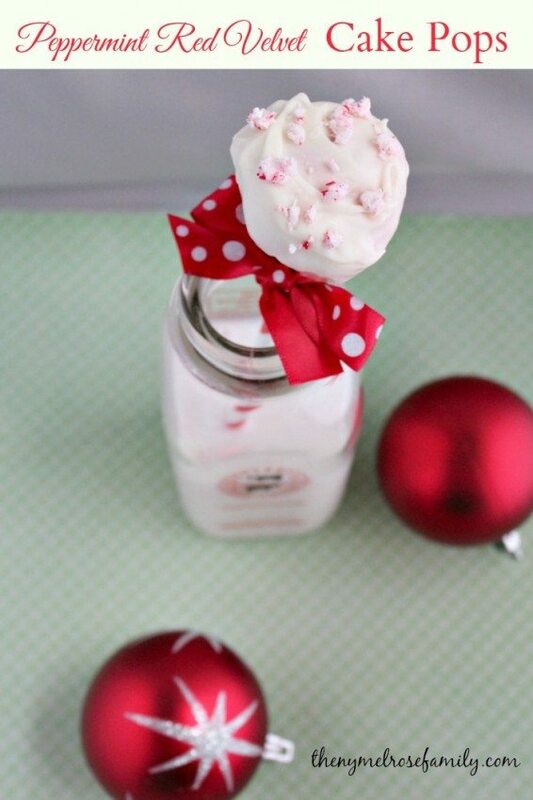 Dip the popsicle stick into the melted white chocolate and then stick into a cake ball. Dip the cake ball on the popsicle stick into the melted white chocolate and coat. 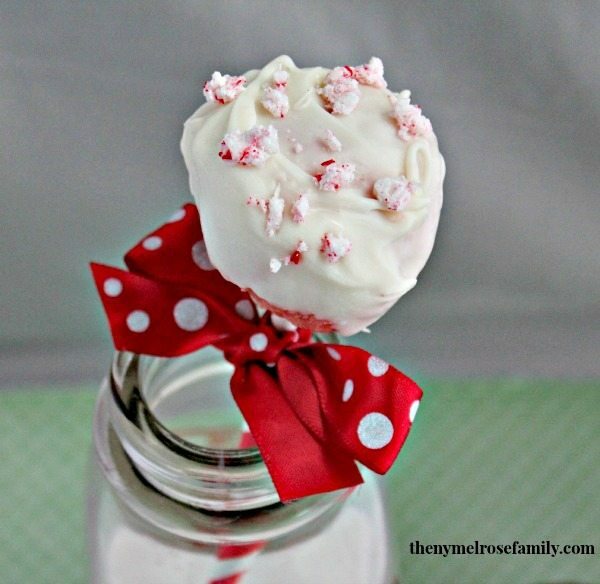 Sprinkle the cake ball with smashed peppermint candies. These look amazing! I also love Peppermint and Red Velvet. What a wonderful combination!